Miguel Capelo has won Free Accommodation 1 time! "We (Sandra and myself) are truly grateful to everyone involved in this prize, including the owners Merlè and André from Elim Bed & Breakfast at Kuils Rivier Cape Town. Anyone reading this. If you are traveling somewhere and don't know anything about the town, here is a handy and tried protocol to use: 1) Phone the helpful people at sleeping-out (021 762 1543) 2) Tell them where you have to be and where you will be traveling. Tell them your budget and give them your email. 3) Sit back and wait. (Could take up to a full day) 4) Go through all the options they present to you - one by one and check (google etc) 5) Take your shortlist of places to stay and contact them. Hopefully, when they respond, they will have space available. They normally respond within the day. (Elim responded within 2 hours) Well done and thank you once again. 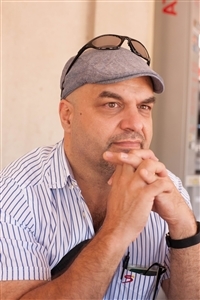 Miguel Capelo"
Elim Bed & Breakfast is the perfect base from where you can visit all that the Cape has to offer. Our establishment is centrally located in the Cape Peninsula and easily accessed from the airport, N2, N1 and the Wine lands. Shopping Centres, Wedding Venues, Golf Courses and The Stellenbosch Wine Route is on our door step. 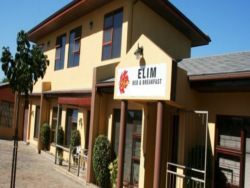 Our Central location makes Elim Bed & Breakfast ideal for holiday makers and business guests alike. We can take all the hassles from your shoulders as we provide a shuttle, laundry and all meals included service to all our guests at reasonable rates. All such services can be customized to suit your individual needs. We offer our guests warm hospitality and complete comfort in a quiet and safe environment. Our facilities, services and rates are aimed at the needs of the business traveler or tourist seeking a more personal and homely experience without sacrificing quality and professional service. Our sustained growth over the years and our high level of repeat business are indicative of our ability to satisfy the needs of our selected market. There are numerous attractions like conference centers, a magnificent golf-course, shopping malls, cinemas, Gymnasium, top-quality restaurants and hiking trails in the area. The new Zevenwacht Shopping Mall is just 2 kilometers away and the Zevenwacht Wine Estate with its exceptional restaurant is also a visitor's delight. The guest house has tastefully African furniture and décor to reinforce the general cozy atmosphere. Elim B&B offers its guests an exclusive air of elegance and charm. We have a lovely patio with an enclosed swimming pool to relax, together with braai and bar facilities where businessmen will be able to unwind and feel totally at home. Our services are genuinely with a smile and Elim is the ideal place to make one's home away from home, whether your stay is for working or playing. Our establishment consists of: Eight double and two twin elegantly furnished rooms. All rooms with its own en-suite bathrooms, television, internet access, bar fridge, ceiling fan and in room coffee making facilities. All guest rooms are non smoking areas. Provision for smoking is made outside at the pool area and Lapa. Secure parking behind remote controlled gates.